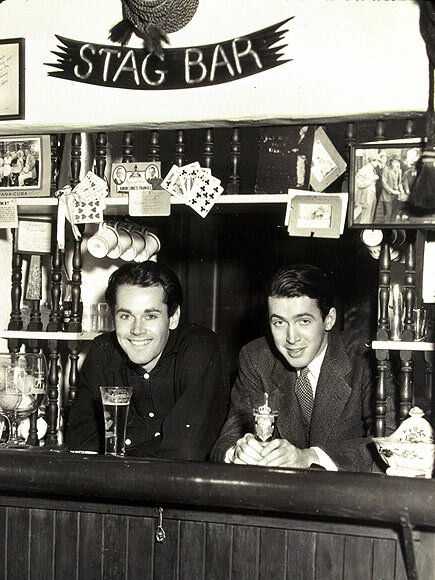 Stewart and Fonda in their early theater days. This post is a part of the Dynamic Duos In Classic Film Blogathon, hosted by Once Upon a Screen and Classic Movie Hub. 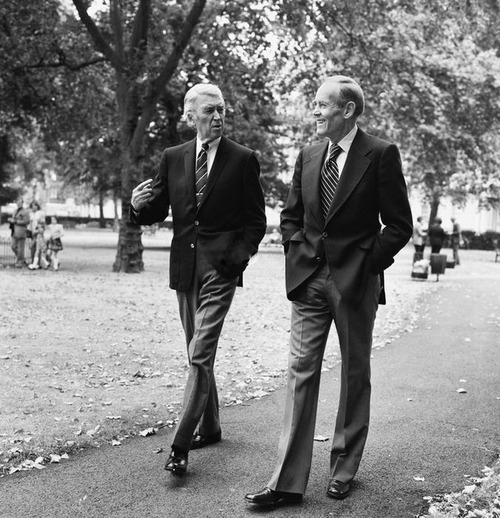 There have been many famous friendships in Hollywood, and one of the longest and most cited is Jimmy Stewart and Henry Fonda’s. The two meet when both were starting out in summer stock theater in the New England area, Stewart just having graduated from Princeton and Fonda having come from the regional theaters in the Midwest. Along with Josh Logan, Stewart and Fonda moved into an apartment in New York City. After honing their skills on Broadway, Stewart eventually followed Fonda out to Hollywood once the movies came calling, and they once again were roommates in their early movie years. 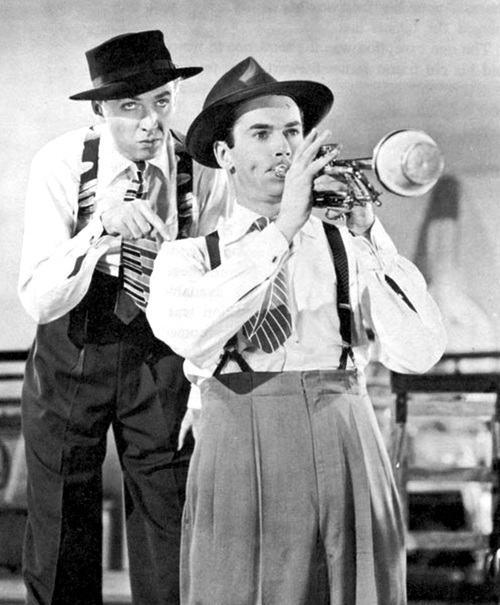 Stewart and Fonda play jazz musicians Slim and Link, who are traveling by bus with their big band. The two find themselves stuck at a seaside resort when their bus breaks down. Hoping to earn the money for their repairs by hosting and fixing a music talent contest, the two find themselves out a band and stranded when they are foiled by the talents of a female trumpet player who outplays the competition (with the help of Fonda and Stewart’s rigging plan going up in smoke). Trumpet star Harry James makes a brief appearance to help judge the contest, and it’s great fun to see Stewart and Fonda in their younger years onscreen together. Their next pairing would come twenty years later in Vincent McEveety’s Firecreek. The film put Stewart and Fonda on opposite sides of the law, with Stewart as a sheriff trying to protect his town against Fonda’s gang of gunfighters. But it is their last pairing that might be the most endearing. Made two years after Firecreek, Stewart and Fonda teamed up to play best friends in Gene Kelly’s The Cheyenne Social Club. Stewart and Fonda play cowboys who have been working the ranges when Stewart’s character, John O’Hanlan, gets a letter announcing his brother has left him an establishment called the Cheyenne Social Club in his will. Fonda’s Harley Sullivan decides to join O’Hanlan for the ride to Cheyenne. When they arrive, they realize the Cheyenne Social Club is a house of ill repute. Determined to make something respectable of the brothel, O’Hanlan and Sullivan get more than they bargained for with the Club and its inhabitants, lead by Jenny (Shirley Jones). The film’s premise, while slightly risque, lends itself well as a vehicle for innocent comedy for Stewart and Fonda. The two are perfectly cast as two old cowboys, their lifelong friendship showing through. The film also allows for a humorous scene where Stewart and Fonda debate politics, which also stands as a reflection of their real-life relationship. Stewart, a Republican, and the Democrat Fonda had once come to blows in their early years over differences of politics, but had agreed for the sake of their friendship that they would never discuss politics again. It was also on this film that Stewart rode his longtime western horse, Pie, for the last time. The horse was well into his twenties, and would pass away after filming concluded. Fonda, knowing how much the horse meant to his friend, and being an accomplished artist, worked on a watercolor painting of Pie in his spare time during the shoot. He presented to the painting to Stewart, who counted it as one of his prized possessions. 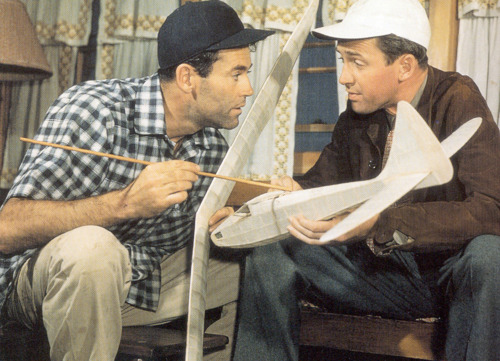 As evidence to the depth of their friendship, there are many stories of how Fonda and Stewart would spend time together building model airplanes, not talking, just enjoying the mutual company. I wanted to leave you with one of my favorite clips, a rare public appearance of Fonda roasting his friend, giving just a small peek at their long history together starting back when they were unknown actors. It’s fun to get a glimpse through their films and clips together of a lifelong friendship between two of the screen’s greatest actors. 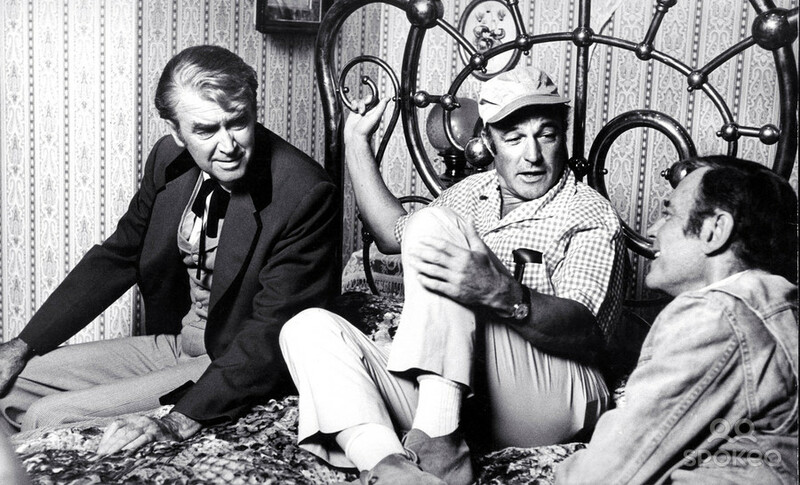 This entry was posted in Actors, Jimmy Stewart Project and tagged blogathon, classic film, Firecreek, friendship, Gene Kelly, Henry Fonda, Jimmy Stewart, On Our Merry Way, The Cheyenne Social Club, western. Bookmark the permalink. Thank you so much for reading, and hosting! The Cheyenne Social Club is a fun movie, not deep at all, but nice light fare. How lovely of Henry to paint Pie for Jimmy. A lovely portrait of real friendship that we get to experience through their work. Yes, what a treasured gift that would be. Thank you for reading! Great to know that these stars were such good friends away from the cameras. I’ve just recorded ‘Firecreek’ from TV, so will be interested to see their work together in that! Thanks for stopping by! Firecreek is fun, especially to see them on opposite sides of the law showing down against one another. I’ve watched it now and really liked it – both of them are excellent, and it’s a fantastic scene where Stewart talks about how combating the bad guys was his business. Aww, what a wonderful tribute to both men. I love that Fonda painted a portrait of Stewart’s horse — what a sweet thing to do. Great post! I remember I had seen a photo of the painting in a book once, but I can remember the title. It was a book looking at different movie horses, and in the back there was a full page color photo of the painting of Pie. Really lovely. Thanks for reading! Oh, the video in the end! Their friendship is one of the best in old Hollywood, and they sure had wonderful moments off-screen! I love that video 🙂 Thanks so much for stopping by! Aww, so sweet! Thanks for sharing the wonderful tale of this friendship. These Fonda-Stewart titles are going straight onto my To-Watch list! Thanks so much for reading! On Our Merry Way is kind of fun because the other episodes feature Dorothy Lamour, Fred MacMurray and William Demarest. I really do get a laugh out of The Cheyenne Social Club as well, so have fun! I enjoyed so much about your post — I had no idea Henry Fond could paint — that painting is awesome. Also didn’t know that Jimmy Stewart pined after Margaret Sullavan — interesting that it didn’t affect his friendship with Fonda. Loved the video clip, too! Thanks so much for reading and your comment. The Stewart/Sullavan relationship is something I’ve heard a lot about, and I do think they share something special that shows onscreen in all of their pairings. I was really surprised when I found out what a great painter Fonda was as well! Fonda is of Dutch with a touch of Italian in him. He is Dutch as Wooden shoes! Bogart is part Dutch. I thought they made a lot more, but was surprised when I looked it up a few years back. Hi Mike! Thank you for your comment (I’ve been moving across the country this past week and hadn’t logged in to read or approve comments). I’ve added your correction to the body above. Thank you for reading!